In its second season, Donald Glover’s Atlanta is beginning to remind me quite a bit of Nashville. Not the soapy drama currently in its final season on CMT, but Robert Altman’s 1975 movie classic, in the way that both subtly capture a cultural moment in an authentic setting with satirical humor underscored by dread. 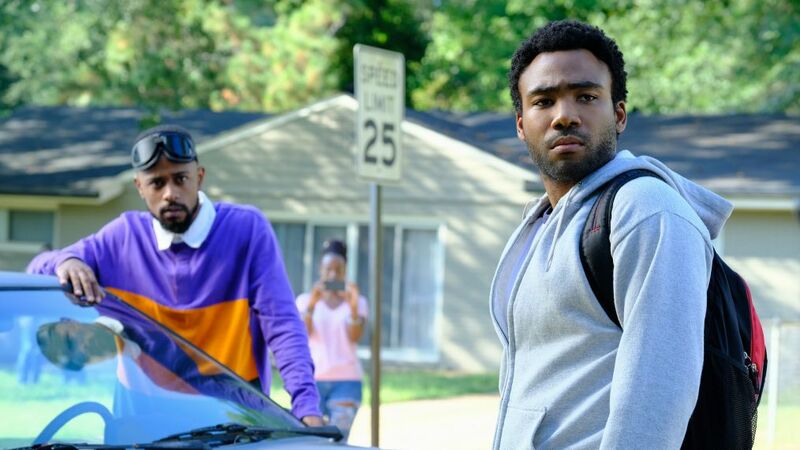 Through the first three Atlanta episodes, not a lot happens, but a queasy unease grows as Earn (Glover) continues to drift through life, still without a permanent home, passively managing—though not very effectively—the career of his emerging rap-star cousin Alfred, aka Paper Boi (Brian Tyree Henry, a lumbering bear of inscrutable disdain). Alfred, uneasy with fame and anxious for riches but unwilling to sell out, spends much of his time trying to score weed, while amusingly running afoul of social-media rabbit holes. Alfred's laid-back approach is in marked contrast to the commercialized success of image-conscious young rapper Clark County (RJ Walker), who shuns drugs and alcohol, and whose perky ad for Yoo-hoo has Paper Boi reaching for the nearest illegal substance. In the darkest moment of the new season, Alfred and wry sidekick Darius (Lakeith Stanfield) are hanging out in Clark's recording studio when a series of technical glitches reveal a dangerously passive-aggressive side to this upbeat up-and-comer. In the most surreal escapade, Earn takes his girlfriend, Van (Zazie Beetz), out for a night on the town, only to be rebuffed any time he tries to spend a $100 bill. He’s too small a fry to be living large, especially during “robbin’ season” (the show’s subtitle this year)—meaning a time when crime spikes around Christmas. Just watch poor Earn try to work a gift-card scam. It doesn't come natural to this good guy in a confusing world. Though it's hard to predict where any of this is headed, Atlanta is still destination TV.